I’m happy to announce the latest update to BeerSmith, V2.3 is coming on 8 August and has been in beta testing since June. 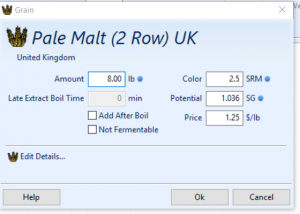 BeerSmith V2.3 includes some of the most asked for features including much easier recipe editing, enhanced water tools, mash pH prediction and adjustment and significant updates to the brewing engine. 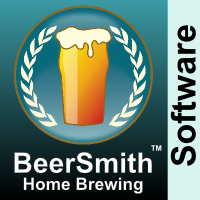 The next BeerSmith release will be a free update for existing BeerSmith 2 users for Mac and PC on 8 August with the Linux version to follow a short time later. The Mac release will be available for 64 bit systems (OSX 10.9/Mavericks and higher) and Linux will be for current Ubuntu 64 bit systems. The Windows update will run on Windows 7 and higher. Changes to BeerSmith mobile are also planned for the fall to bring it in line with the new desktop features. A new “Session” tab that consolidates brewing session data in one place and makes it easy to compare planned vs actual readings. 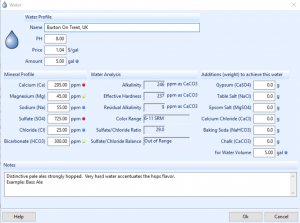 Mash pH estimation and acid adjustments built into the recipe editor along with improved water analysis. Simplified recipe editing that makes it easier to create and adjust recipes including things like copy/paste/undo, the ability to add/delete multiple items at once, proper keyboard shortcuts and focus handling, and more. Support for wide screen monitors including many resizable dialogs. Proper late sugar additions for all grain, as well as a separate mash gravity and mash efficiency estimation. Support for CO2 as well as isomerized hop extract additions. The ability to lock/unlock recipes for editing. An improved brewing engine that can integrate hop additions as gravity changes in the boil as well as carry over unused hops into the whirlpool for long whirlpool or “no chill” brewing. A large number of bug fixes, usability enhancements, and recipe editing features to make the program easier to use. A new session tab replaces the fermentation tab for each recipe and lets you record session readings in one place so you can easily compare predicted vs actual values. Each field is color coded yellow until an actual value is entered making it easy to track the items you have entered from the ones still to be done. A reset button near the top sets all of the values equal to the estimates so you can easily reset for another batch. Near the bottom of this tab I’ve also added support for fermentation tracking and you can enter fermentation gravity and temperature readings and graph them against your planned fermentation profile. When you open an ingredient for editing, BeerSmith now shows a simplified dialog with focus on the amount of that ingredient which makes it much easier to quickly adjust it. You can still get the full details by clicking on the detail button a the bottom of the ingredient. You can now change the amount of an ingredient by editing the amount column directly on the ingredient list – never even opening a dialog. Adding/altering ingredients is easier too. The new add ingredient dialogs all have a button that lets you add the currently selected ingredient without closing the dialog so you can enter a bunch of hop additions quickly. You can also now select multiple ingredients and delete them all at once. Keyboard focus issues were corrected and shortcuts have been added so you can easily add ingredients using the keyboard (Ctrl-Y for yeast, Ctrl-W for water, etc…) as long as the ingredient list has focus. Copy, paste, duplicate, and an undo button are now active on the ingredient list making it easier to handle small changes. A new button for adjusting individual IBU contributions from hops is also active now. The ingredient display expands to take advantage of larger screens and the custom field display space was doubled. Water analysis has been added throughout the program to calculate recommended ion ranges, residual alkalinity, sulfate to chloride ratios, and hardness for all water profiles. Recommended ion ranges for brewing are shown using the colored balls next to the ions. You can also now enter a price for water and track the cost for the overall beer. 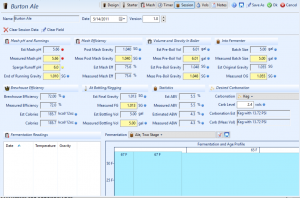 In addition, mash pH estimation has been integrated into the mash tab of the recipe builder and it will take into account the water profile as well as grains used in the recipe. From that tab you can also enter a measured mash pH value and use that to calculate acid adjustments needed to lower your mash pH based using phosphoric, lactic or acid malt. A separate mash pH tool is also available to do this calculation on the fly if needed. hardness, chloride/sulfate ratio, bitterness profile of water – now available for all water profiles. – Added feature to allow “lock file override” if the program has a copy that did not close properly. Man “I’ve also added support for fermentation tracking”, love it!!!!! Thanks Brad. I’m on Linux, and I’m looking forward to this update, especially the mash pH estimator. This looks awesome… one question on the Water enhancements… will there be a feature to use % solutions of salts instead of their dry equivalents. For instance, due to CaCl2’s extremely high water absorption rate, the ‘dry’ salts are hard to measure accurately from batch to batch. Using a solution of CaCl2 mitigates that as it remains quite stable (I’ve been using the same bottle of 15% solution I made up for over a year now and its gravity hasn’t changed yet). Can we expected a change in the user interface in the near future? Looking forward to the new updates. I do not think I saw it, but it would be nice to have a function to indicate doing a cold steep of grains of adding them in at the end of mash. This would help with the pH Mash tools. Looks cool! Is the linux version moving to GTK3 finally? I just compiled it with GTK3 and Ubuntu 16.04 this morning and have a beta version working. Drop me an email at beersmith at beersmith.com if you want to beta test. I did clean up a very large number of items and simplified the recipe entry for this version. I have not added this yet. Hi Brad, is it possible become a beta tester for the windows version? I’m realy interested in water ph adjustment. thanks!! Great additions/fixes! Looking forward to changes that would allow Parti-gyle style batches, without a ton of extra work calculating, etc. That coming soon? This all looks great, Brad! You have me reeled in so tight, I could not live without my Beersmith and Grainfather combination! Love your news letters too! Awesome contribution to the craft brewing community! First of all Thank you for all this hard work! BeerSmith has a really helped a newbie like get started. The first four most recent entries of your blog do not display with either Chrome or Microsoft Explorer but this one and the ones below do. I just see a blank webpage when I click on them. I am not sure what the problem is. Is anyone else having this problem? I had some issues with page caching. It should be working now. How does one adjust the font size and type for recipes in version 2.3? I don’t see any options for that on the Look and Feel tab under Options. When I open my version 2.2.12, it tells me there is a new version and asks if I want to download it in the background. I say yes, shortly thereafter I get a message that it can’t connect to the server- yet I am definitely connected to the internet. Any tips? Thanks! download page. There are upgrade instructions near the bottom of the page. You cant change the fonts. I know some people have had problems with font blurriness on Windows 10 at certain resolutions. If you are having this issue please send me a screen shot to beersmith at beersmith.com as I am working hard on a fix for this which I hope to get out next week. I know there is a not that there is 200% scaling support but I’m not sure if I’m being properly scaled. I’m at 150% scaling currently in my desktop settings. Did you download the 2.3.7 patch (available on the main download page). It should help with this and be usable even if scaled. Thanks, love the update. One question regarding mash pH. I typically use Brun water, and would like to just use Beersmith. I have created my water profile. Through the ingredient tab, I add the water profile, and then add the amount of acid to lower my pH to the desired level. (Determined by using BruN water) But, the estimated mash pH does not change. It is the same as before I added the acid in the ingredient panel. Am I missing something? I’ve used this water profile before, and I use a pH meter. So, I know about where my pH should be, but it is not adjusting in beersmith. Any help is greatly appreciated! !